Ben Harper a juste fini d’enregistrer un album de duos avec sa mère, auteur-compositeur-interprète Ellen Chase-Verdries. L’album, Childhood Home, composé de 10 titres, tous écrits par Ben Harper et sa mère, devrait sortir le jour de la Fête des Mères. A l’occasion de la fête de la Saint Valentin Ben Harper a repris la chanson « Fade Into You » de Mazzy Star. Cette version est disponible sur l’album « Sweetheart 2014 ». Pour plus d’informations vous pouvez vous rendre sur le site officiel www.sweetheartalbum.com. Ben Harper is known mainly for his guitar chops, but he’s putting down the axe for his contribution to Starbucks’ Sweetheart 2014 compilation album. Instead, he pulls up a piano stool and delivers a gentle cover of Mazzy Star’s 1994 single “Fade into You”. It’s an interesting choice, considering the original version is driven as much by acoustic guitar as piano keys, but Harper is going for a different feel with his rendition. By paring the track down to slow, full piano chords, Harper imbues it with a haunting sense of loss. The wavering of his voice as he enters the chorus does little to mask the delicate sadness as he sings Hope Sandoval’s words. Take a listen below. “Fade into You” is just one of 13 covers of popular love songs featured on Sweetheart 2014, available exclusively in Starbucks stores or digitally via Concord Music Group. While we’ve also already heard Vampire Weekend’s take on “Con te Partirò”, Beck do John Lennon’s “Love”, and Fiona Apple cover Anton Karas’s “I’m in the Middle of a Riddle”, the album also features contributions by Jim James and Phosphorescent. See the full tracklist below. [lang_en]Ben Harper & the Innocent Criminals, come back in Europe. they will do severals music festivals, many dates will be in France. See all the dates of the European Summer Tour 2008. Ben Harper & the Innocent Criminals, reviennent pour une tournée européenne. Ils participeront essentiellement à des Festivals, plusieurs dates sont déjà officielles pour la France. Voici donc les concerts prévus pour le moment en Europe pour 2008. Early in 2007, Jack Johnson began remodeling an old L.A. mansion that also houses a recording studio and offices for his record label, Brushfire Records. Eco-friendly building renovations were made, and last June he began tracking his new album, Sleep Through the Static, out this month. The album was produced by J.P. Plunier, with recording and mixing by engineer Robert Carranza, and features Johnson’s band: Merlo Podlewski on bass, Adam Topol on drums and Zach Gill on keyboards. In contrast to the Pro Tools production on Johnson’s recent albums, the group went analog this time, tracking to Studer 24-track. “I liked not looking at the music on a computer screen — just hearing it,” says Johnson. “If it had a good feel, you moved on, living with your little mistakes. Those little mistakes become part of the character of the song. “Jack has kind of a velvet voice, and this is the first time I really got the sound I have been trying to get all along,” says Carranza. On the guitar is an Audio-Technica 4050. Zach Gill’s keyboards include Celeste, Clavinet, Wurlitzer, Rhodes, Moog and piano. “He did most of the piano live,” explains Carrana. “It was blocked off, with the soundboard faced away from the drums with a little gobo, some 451s and that was our tracking style. Sometimes he played through a little Fender Deluxe amp miked with a [Shure] 57.” Pianos went through two Neve 1073s miked L/C/R using less of the center to create space. L’artiste a enregistré son prochain opus d’une manière originale, en respectant l’environnement. 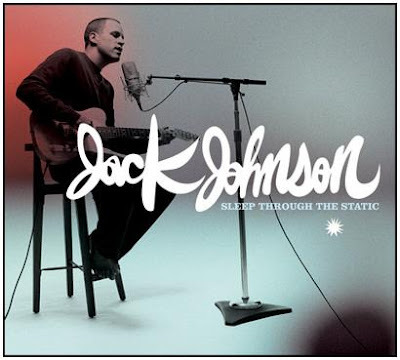 Le prochain album de Jack Johnson, « Sleep Through The Static », est attendu pour le 4 février prochain. Le premier single, « If I Had Eyes », est disponible sur les plateformes de téléchargement depuis le 13 décembre. La particularité de ce disque est qu’il a été enregistré dans des studios d’Hawaï fonctionnant entièrement à l’énergie solaire ! L’esprit écologiste du chanteur se répercutera sur les thèmes des chansons. « Certains titres traitent du monde dans lequel nos enfants vont grandir, à la fois rempli de guerre et d’amour, de pessimisme et d’espoir », a précisé l’artiste au magazine américain Billboard. Voici un petit extrait de La Musicale (canal+) où Ben Harper & Vanessa Paradis chantent ensemble Waiting On An Angel. Vous y étiez, laissez un commentaire….